Paris St-Germain suffered a shock first defeat of the season as lowly Evian prevented the Ligue 1 leaders from equalling a club-record unbeaten run. The defending champions had gone 36 matches unbeaten but missed chances means they are only a point ahead of Lille. Second-half goals from Clarck N'Sikulu and Modou Sougou gave the hosts a first top flight win over PSG. Their record 37-game unbeaten run was set in 1993-94. Evian stunned the visitors in the 75th minute when Sougou pulled the ball back to N'Sikulu, who steered it low into the net. Sougou added his name to the scoresheet with the second goal in the 87th minute as PSG failed to score in a league match for the first time this season. Lille and Monaco closed in on the leaders with victories on Tuesday. Monaco won 3-0 at Cote d'Azur rivals Nice and Lille overcame Marseille 1-0 at home. Match ends, Evian Thonon Gaillard 2, Paris Saint Germain 0. Second Half ends, Evian Thonon Gaillard 2, Paris Saint Germain 0. Cédric Cambon (Evian Thonon Gaillard) wins a free kick in the defensive half. Goal! Evian Thonon Gaillard 2, Paris Saint Germain 0. Modou Sougou (Evian Thonon Gaillard) right footed shot from the centre of the box to the centre of the goal. Assisted by Daniel Wass. Attempt blocked. Blaise Matuidi (Paris Saint Germain) left footed shot from outside the box is blocked. Assisted by Zlatan Ibrahimovic. Attempt saved. Javier Pastore (Paris Saint Germain) header from the centre of the box is saved in the top centre of the goal. Assisted by Zlatan Ibrahimovic. Attempt blocked. Javier Pastore (Paris Saint Germain) left footed shot from the centre of the box is blocked. Assisted by Edinson Cavani. 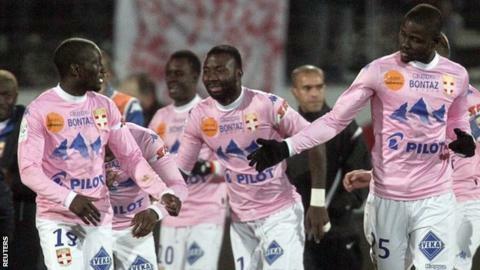 Delay in match Modou Sougou (Evian Thonon Gaillard) because of an injury. Attempt saved. Daniel Wass (Evian Thonon Gaillard) right footed shot from outside the box is saved in the bottom right corner. Assisted by Cédric Cambon. Attempt blocked. Daniel Wass (Evian Thonon Gaillard) right footed shot from outside the box is blocked. Attempt blocked. Daniel Wass (Evian Thonon Gaillard) right footed shot from more than 35 yards is blocked. Attempt missed. Lucas Moura (Paris Saint Germain) right footed shot from outside the box misses to the right. Assisted by Christophe Jallet. Eric Tié Bi (Evian Thonon Gaillard) wins a free kick on the left wing. Foul by Eric Tié Bi (Evian Thonon Gaillard). Foul by Youssouf Sabaly (Evian Thonon Gaillard). Attempt saved. Blaise Matuidi (Paris Saint Germain) left footed shot from the centre of the box is saved in the centre of the goal. Assisted by Edinson Cavani. Goal! Evian Thonon Gaillard 1, Paris Saint Germain 0. Clarck N'Sikulu (Evian Thonon Gaillard) left footed shot from outside the box to the bottom right corner following a fast break. Attempt blocked. Modou Sougou (Evian Thonon Gaillard) right footed shot from the left side of the box is blocked. Assisted by Brice Dja Djédjé. Attempt missed. Thiago Silva (Paris Saint Germain) header from the centre of the box misses to the left. Assisted by Lucas Moura with a cross following a corner. Corner, Paris Saint Germain. Conceded by Youssouf Sabaly. Foul by Modou Sougou (Evian Thonon Gaillard). Substitution, Evian Thonon Gaillard. Clarck N'Sikulu replaces Marco Ruben. Eric Tié Bi (Evian Thonon Gaillard) wins a free kick in the defensive half. Zlatan Ibrahimovic (Paris Saint Germain) wins a free kick in the defensive half. Foul by Jonathan Mensah (Evian Thonon Gaillard). Corner, Evian Thonon Gaillard. Conceded by Thiago Silva. Attempt blocked. Daniel Wass (Evian Thonon Gaillard) left footed shot from outside the box is blocked. Substitution, Evian Thonon Gaillard. Cédric Cambon replaces Djakaridja Kone. Attempt saved. Zlatan Ibrahimovic (Paris Saint Germain) right footed shot from the right side of the box is saved in the top left corner. Assisted by Thiago Silva.